Hotel Ferdinand is a small exclusive boutique-hotel, in central Aarhus, emphasizing “hygge” and city life. The hotel has 8 luxurious suites as well as spacious serviced apartments. Besides this, the hotel has facilities such as an award-winning restaurant, named in the prestigious Michelin Guide. A modern lounge and a speak-easy bar right in our own backyard. We have 8 large and luxurious suites with first class sleep comfort and a unique decoration created exclusively for Ferdinand. The suites can be up to 70 square meters, accommodating maximum 4 overnight guests. In addition, all the suites have lovely bright and spacious bathrooms with showers. All suites have a minibar, Nespresso machine, TV and free Wi-Fi. Check in from 14.00 - Check out by noon at 11.00. Ferdinand has 6 spacious studios, all over 30 square meters, stylish and with good sleeping comfort. Our studios have a small kitchen and a balcony against quiet back yard in Aarhus C. In addition, our studios have good bath facilities as well as both washing machine and dryer. 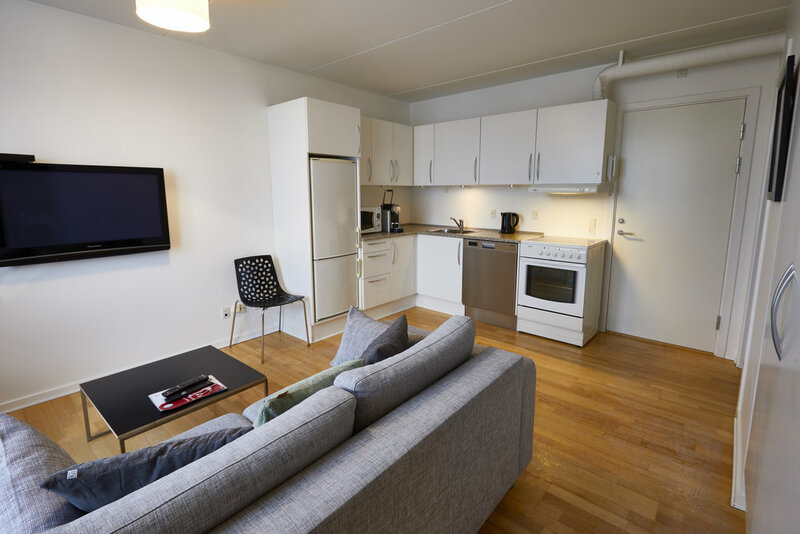 All studios have a Nespresso machine, TV and free Wi-Fi. Ferdinand has 5 premium studios all over 44 square meters, which are uniquely decorated with each style theme. Our premium studios have a small kitchen and a balcony facing the river. In addition, our premium studios have good bath facilities as well as a washing machine and a dryer. All premium studios also have their own Nespresso machine, TV and free WI-FI. Check-in from 14.00 - check out at 11.00. Rent a suite on a day-to-day basis for conferences, such as showrooms or for private events. The suite includes Wi-Fi, meeting table and 55 "flat screen. The suite can accommodate up to 14 people. Coffee, tea, ice water and fruit are served in the suite, while breakfast and lunch are served in the restaurant. Contact us at +45 8732 1444 or mail@hotelferdinand.dk for further details. Have a romantic stay in Aarhus. Enjoy each other, play golf, go for walks along the beach, at the marina or in the woods. Visit the Old City, Tivoli or Aarhus' famous art museum ARoS. Whatever you find, it is close by. Hotel Ferdinand is located on Åboulevarden, directly down to the charming river, which runs through Aarhus city center. It is the center of the city life, while at the same time offering coffee houses and shopping in the small streets. Dokk1: https://dokk1.dk/besog-dokk1/parkering 250kr for one day. 250 meters from Hotel Ferdinand. Magasin: https://www.q-park.dk/da/parkering/aarhus/magasin-aarhus/ 290kr for one day. 300 meters from Hotel Ferdinand. The hotel is located on the Åboulevarden, right in the middle of Aarhus, so noise from people, cafes, and nightclubs is unavoidable, but it is usually only in weekends. Pets are not allowed at the hotel or in the restaurant. Company cards issued within or outside EU / EEA, as well as private payment cards issued outside the EU / EEA, will be subject to a fee. The fee will depend on the type of payment card and where it is issued. 'No-show' or cancellations of reservations within 48 hours before arrival will be invoiced with the full amount. For bookings of 1, 2 or 3 rooms and cancellation up to 2 days before the date of arrival, there is no payment. If the room / rooms are canceled later or at no show, 100% will be paid. For bookings of more rooms, and for events over 10 persons. 1. - Cancellation of 4 or more rooms must be done in writing within 4 weeks prior to the event, on mail@hotelferdinand.dk. 2. - If canceled later than 4 weeks before the event is held, it is mandatory to replace the hotel's loss - max. 75% of agreed arrangement price inclusive. If canceled later than 8 days prior to the event, you are required to pay the full amount of services ordered. Full cover for non-cancellable services is required. 3. - Reduction up to 35% in the number of participants must be notified in writing to the hotel no later than 2 weeks before the event, by mail. In case of a reduction of more than 35% after this date, reimbursement will be required as stipulated in the 2nd point.